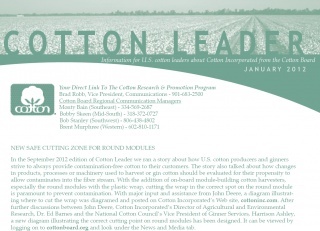 The much-anticipated 2014 Cotton Board Industry Calendars are nearing completion and are set to ship in early December. This calendar is a great resource for cotton industry meeting dates and information on the Cotton Research and Promotion Program. We would like to extend a sincere thank-you to the sponsors of our 2014 calendar: Acala Farms Flavored Cottonseed Oil, Bayer Crop Science, Helena, Plaza Transportation Co., Staplcotn, the Southern Cotton Ginners Association and T.J. Beall Company. The Cotton Board would not be able to produce this calendar without their sponsorship and invaluable ongoing support of the Cotton Research and Promotion Program. the Cotton Board's President & CEO, William A. Gillon, is the current Chairman of the Commodity Roundtable. A consortium of executives who each represent one of our nation's commodity boards, the Commodity Roundtable members meet throughout each year and share information that impacts their respective programs while seeking solutions to issues they may have in common. While most participants are leaders from national research and promotion boards in the seeds and livestock, dairy, poultry and vegetable programs of the United States Department of Agriculture's (USDA) Agricultural Marketing Services (AMS), executives from regional fruit and vegetable marketing orders and propane (which falls under the Department of Energy) also participate. The group normally meets in Washington once each year, and then at a location that is determined by the group. Last month, the group conducted their meeting in Memphis, Tennessee. "This provided me the opportunity to showcase a large cotton farming operation so the entire Roundtable could learn how cotton is harvested, ginned and warehoused," says Gillon. Anne L. Alonzo, Administrator, AMS for the USDA attended, spoke and participated in the tour of a 12,000 acre cotton farm north of Memphis, Tennessee. FLAVOR-INFUSED COTTONSEED OIL ON STORE SHELVES! Cotton Incorporated's Director of Cottonseed Research & Marketing, Tom Wedegaertner, continues to work with Acala Farms to bring flavor-infused cottonseed cooking oils to a broader consumer audience through grocery distribution channels. "Sarah Botham, president of Botham Brand's, Acala Farms, recently announced an agreement between Botham Brands and Verona, Wisconsin distributor L&L Foods, who plan to make Acala Farm cottonseed oils available in stores across southern Wisconsin and northern Illinois," says Wedegaertner. "We also recently led Piggly Wiggly officials to approve putting our oils in 20 of its southern Wisconsin stores," explains Botham. The oils are the only flavor-infused cottonseeds oils available to consumers and Botham said she hopes the agreement will help Acala Farms continue to grab a bigger share of the growing cooking and dipping oil market. The oils can be ordered anytime on line at www.acala-farms.com and could make a great holiday gift. In 2011, the COTTON FROM BLUE TO GREEN™ denim recycling program went global. At that point, anyone, anywhere, anytime could recycle their used denim and give it new life as denim insulation for Habitat for Humanity affiliates around the country to help rebuild homes, often in areas affected by natural disasters. What started as a program to not only help those in need, but to showcase cotton's sustainability, has turned into one of Cotton Incorporated's most celebrated and widely participated promotions. Recently rebranded and now being called Blue Jeans Go Green™, the very successful and consumer-directed sustainability program has reached a true milestone - one million pieces of denim recycled! "This has been a success in every sense of the word," explains Andrea Samber, Co-Director of Strategic Alliances, Cotton Incorporated. To celebrate the one millionth piece of recycled denim, a special event was held this month in Los Angeles. Several big name celebrities, including Rebecca Romijn, Jerry O'Connell, Joe Jonas, Derek Hough, Michael B. Jordan, Miles Teller and cast members from Glee, attended the event to celebrate the program. "We designed and erected closets at the event to showcase denim jeans that had been signed and contributed by celebrities," adds Samber. The celebrity-signed jeans were auctioned through the Blue Jeans Go Green™ Web site www.bluejeansgogreen.org. To further the central cause of the program, which is to get denim for recycling, those who bid on the signed jeans did so not with money, but with items of denim. A highlight of the event was recognition of 13 year old Erek Hansen from Toledo, Ohio, who turned the denim recycling program into a personal project - collecting jeans for over five years now. What began in 2009 as a joint project with National Geographic Kids and COTTON FROM BLUE TO GREEN™ has resulted in his collecting and contributing over 18,000 denim garments for recycling to date. Congratulations Erek! Outside of China, cotton prices around the world moved lower over the past month. Chinese cotton prices (CC Index) remained high and stable near 147 cents/lb. The New York December futures contract broke through important support near 82 cents/lb, closed successively lower for 13 straight days, and dropped to values near 75 cents/ lb before attempting any rebound. Prices have held to levels near 77 cents/lb in the most recent trading. Although the pattern of movement was similar to that of NY futures, the decline in the A Index was less severe, with values falling about half the distance - from 89 cents/lb in early October to values near 85 cents/lb in early November. With the government shutdown, the October USDA report was cancelled. Correspondingly, this month's edition of the Monthly Economic Letter includes comparisons from the September and November USDA reports. The largest revisions in the November report were to historic figures for India. Changes to Indian figures included increases to production estimates from 2007/08 to 2012/13, with the net effect of increasing the 2013/14 Indian ending stocks figure by 1.2 million bales. Other notable changes to production estimates in the November report included a decrease to the Chinese forecast and an increase in the U.S. harvest figure (to 13.1 million bales). The global production figure decreased 209,000 bales, from 117.4 million to 117.2 million. Since the decline in world cotton prices began in early October, several possible causes have been suggested. Among these were the seasonality of supply with the new 2013/14 crop beginning to become available, higher (non-USDA) forecasts for the Indian crop, and a steep rise in certified stocks eligible for delivery against NY futures contracts. More recently, speculation regarding the possibility of a release from the Chinese reserve system emerged as another justification for the drop in prices. This rumor has yet to be confirmed, but prices could be expected to fall if a release occurs and the release price is lower than the level offered in the last auction.